A new school year is just around the corner. Whether you work online or in a traditional classroom, you likely have some food for thought up on your walls. Personally, I keep my own Teacher’s Pledge near my desk. It’s not in view of my webcam, but I can turn my head and see it there every day to remind me of what’s most important in my teaching. I also have a Learner’s Pledge that I offer to any student visiting my website. Here’s something else you might share with your students. Check out my A to Z_handout. It’s a list of what’s needed in order to have a successful language learning experience. You may like it as is, or you may simply be inspired to write your own. In fact, why not create a list with your students and then post it for all to remember throughout the school year? 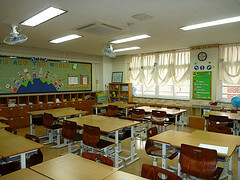 “Inside My Classroom” by Marie. Retrieved from the Creative Commons on Flickr. Previous Post On the Road: More Posts to Come! Next Post How Are You? How Ya Doin’? How Does One Understand Verb Tense Consistency?